Mellieha, Santa Marija Estate: Fantastic and exclusive detached Villa with surrounding landscape areas, a terraced roof garden and pool area. 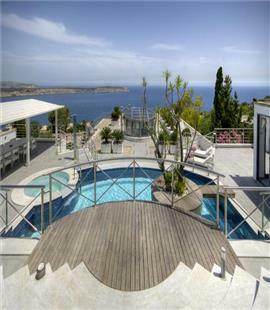 The villa has three floors, the basement, ground and roof garden/pool deck. The basement has an external staircase up to the roof garden/pool deck level. Internally it comprises a garage, gym, wine cellar, office, cinema room, bedroom with en-suite, laundry room. The ground floor includes 3 double bedrooms with en-suite, guest toilet, cloak room, kitchen and open plan sitting and dining room overlooking sea views, 3 open terraces and pool toilets and showers. The roof has an open deck area, pool with cascade, the pool are includes a bar, dining area, BBQ area, chill-out areas and deck. 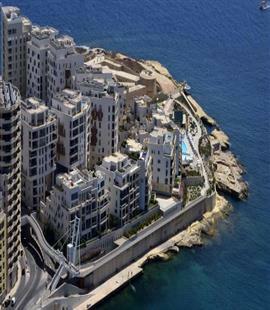 This villa is truly a unique property in Malta.